Fort San Jacinto WWII Radar Site (1) (1944-1946) - A World War II U.S. Army Radar Site established in 1944. Used to provide target information to large caliber (6" and above) coastal gun batteries in the Harbor Defense of the Galveston against enemy warships. Located on Fort San Jacinto near Galveston, Galveston County, Texas. Closed in 1946. Part of the Harbor Defense of Galveston. Fort Burnside HECP Sectional View showing the SCR-582 Antenna Blister on Top. 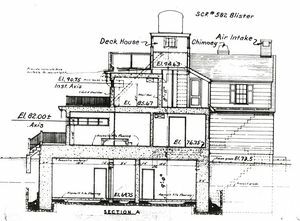 Constructed and transferred for use on 11 Apr 1944 as Fort San Jacinto WWII CCR-582 Radar Site. Construction costs to date of transfer were $28,614.74. The physical plant consisted of a radar set, usually mounted atop an existing building or tower, a powerhouse with two generators and a 1000 gallon fuel tank. The powerhouse was placed on a concrete pad and footings installed by the Corps of Engineers who erected the structure. The radar equipment was installed by the Signal Corps. It required 3.7kW of 120/240 AC, 1 phase, 60 cycle power furnished by commercial power backed up by the two on-site generators. The two 5 kW generators were furnished and installed by the Signal Corps. In operation, the SCR-582 search radar provided an overview of all potential targets within its range. Once enemy targets were identified and plotted at the harbor HECP/HDCP command posts, target assignments were passed by telephone to the appropriate SCR-296 tracking radar site, citing the approximate range and azimuth of the target. Each gun battery 6" or larger had an associated SCR-296 radar site to track specific targets. The SCR-296 radar operators would then find the assigned target and pass the precise range and azimuth to the plotting room at the gun battery by phone. The radar operators would continue to track the target and update the plotting room as the range and azimuth changed. 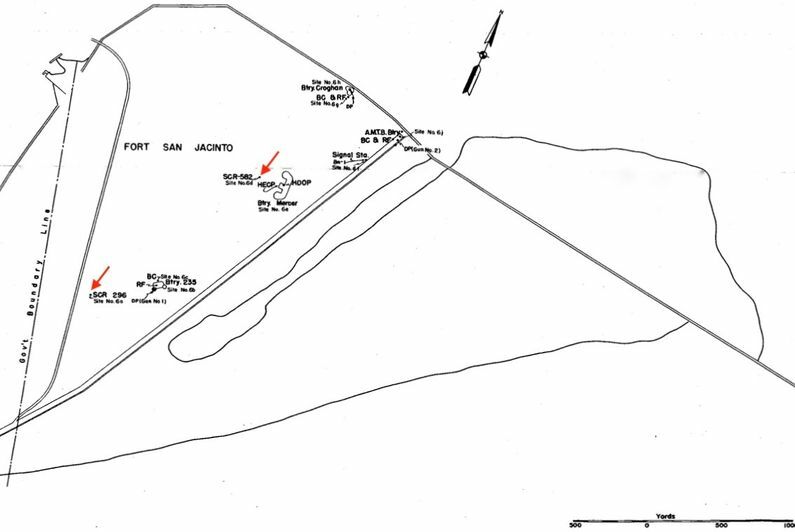 Fort San Jacinto Defenses Plan Showing Both the SCR-296 and the SCR-582 Radar Set Locations. Location: Fort San Jacinto in Galveston County, Texas. RCW-Corrected to September 1945, CDSG. This page was last modified 21:32, 7 January 2019 by John Stanton.